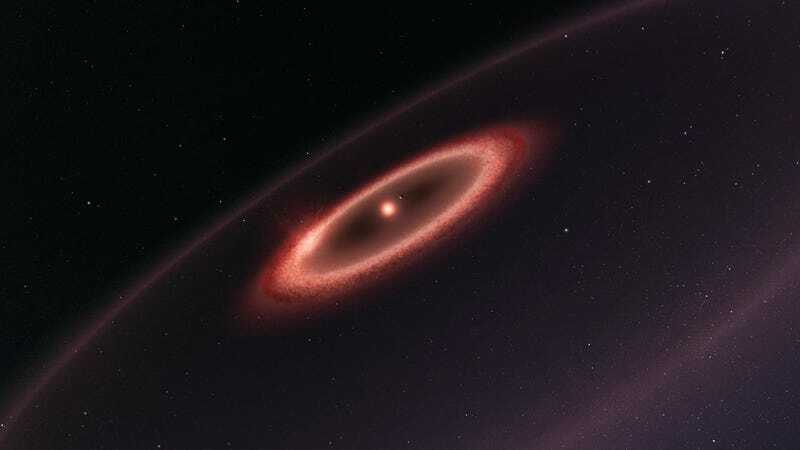 New observations show there’s at least one, but possibly three rings, of cold dust around our nearest star, Proxima Centauri. That could indicate the presence of more planets, according to new research. It would be incredible if astronomers could just look at the sky with infinite resolution telescopes and see precisely what’s going on—but they can’t, even for the closest stars. Instead, they have to take observations from lots of different instruments in lots of different wavelengths of light to piece together an entire picture. After new observations of Proxima Centauri with the Atacama Large Millimeter/submillimeter Array radio telescope in Chile, there are hints that the story is much richer than last year’s already incredible Proxima announcement of a nearby exoplanet in a habitable zone. ALMA, the telescope used to make the discovery, is probably the best telescope of its kind right now that observes far infrared and high frequency microwave light. This comparatively short observation revealed what appeared to be a disk of cold debris around the star. This could mean the presence of other planets that stop more planets from forming, the way Jupiter prevents our solar system’s asteroid belt from coalescing into a planet. There could even be an elaborate planetary system, according to the paper submitted to The Astrophysical Journal Letters. You also might wonder why they can’t just spot a planet directly. Dust has a much higher surface area than single planets so it’s easier to spot, explained Anglada-Escudé. Unfortunately, this ALMA run wasn’t enough to create the incredible images you may have seen of dust disks around other stars. That means scientists don’t know for certain whether there’s a planet or how many rings there are.